Some of the wildlife in my garden. Bees are my favourite. Here the lavender is rich pickings for the bees. 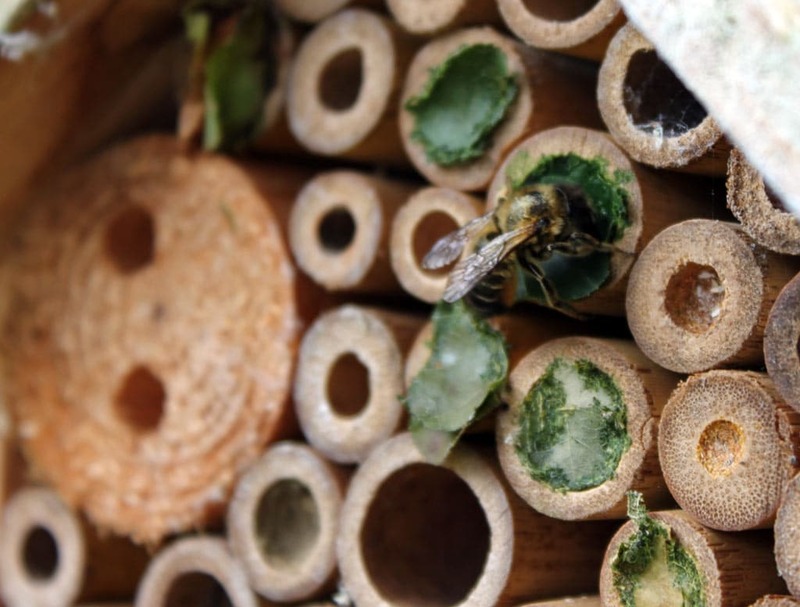 I installed an insect ‘hotel’ on my fence. The one in the shade hasn’t got anything, but this one, which gets a little sun, has attracted a community of bees. 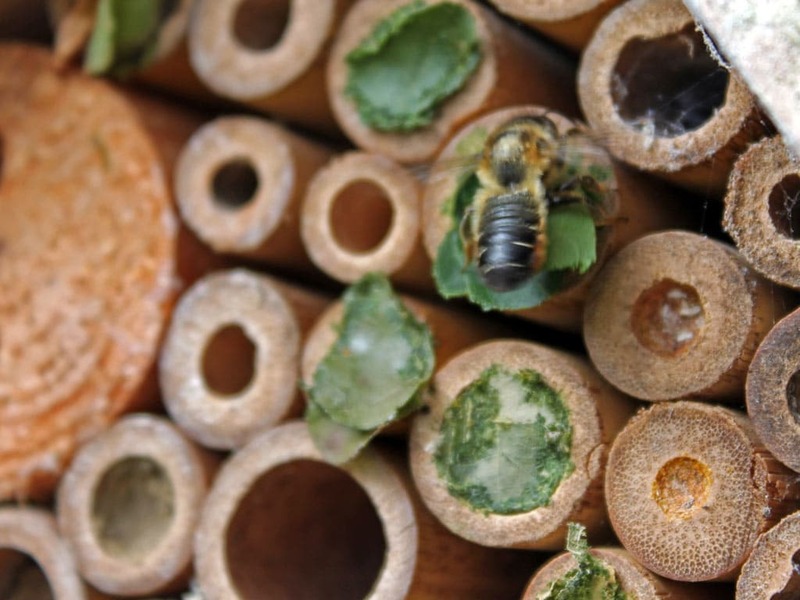 I never knew bees cut up leaves and then stuffed them in tubes like this. I think that is bee wax in other holes, but I’m not sure. The bees are very busy at this time of the year. 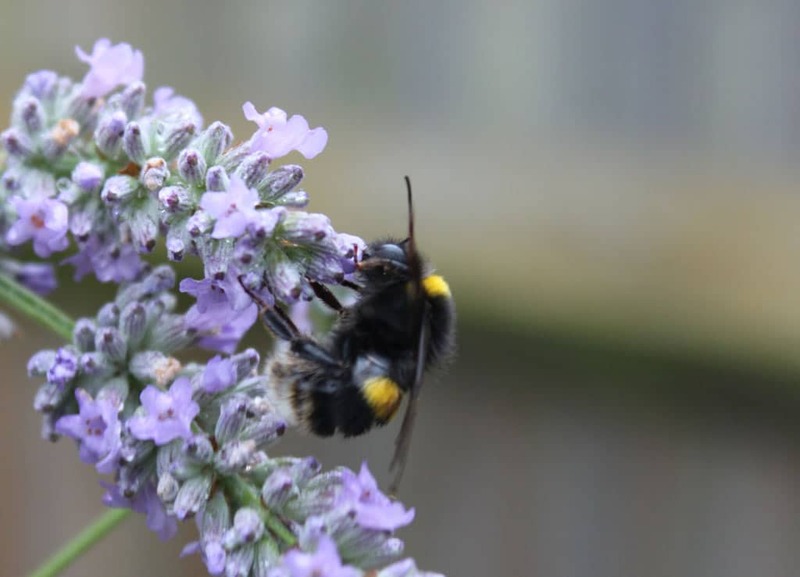 I love bees and it is good to support them because of the declining bee populations around the world. 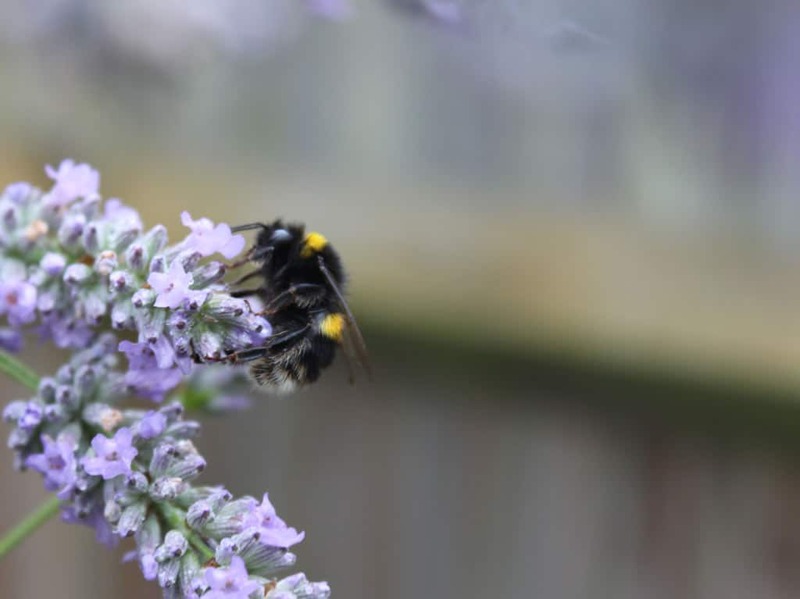 In Sri Chinmoy’s book Animal Kingdom – which describes the qualities of different animals – he states the quality of bee is ‘industry‘ It is fascinating to see them constantly working. It reminds me of a sign my sister used to have on her door. Butterflies are hard to photo because they dart around and rarely stay still for long. 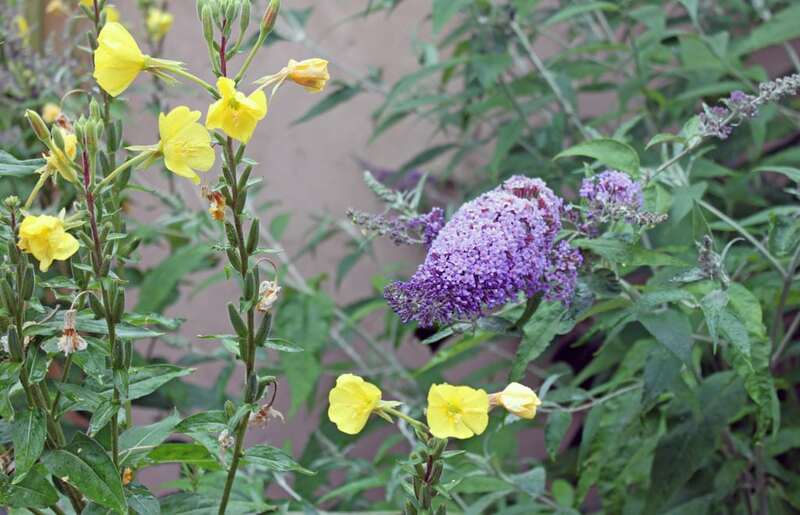 Buddleja, (also spelt Buddleia) with the yellow Evening Primrose. Buddleja is self sown. You see them dominating many railway embankments. 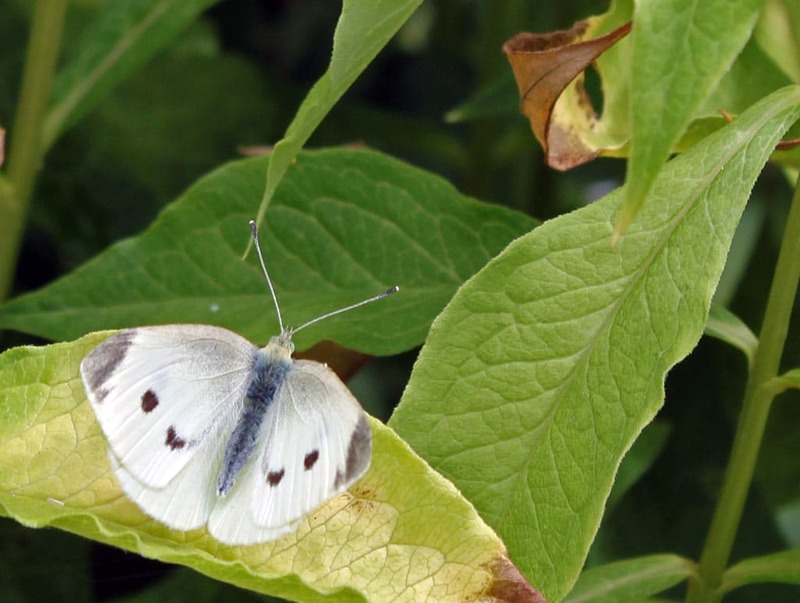 They are very good for butterflies, so I like to have 2 or 3 in the garden. 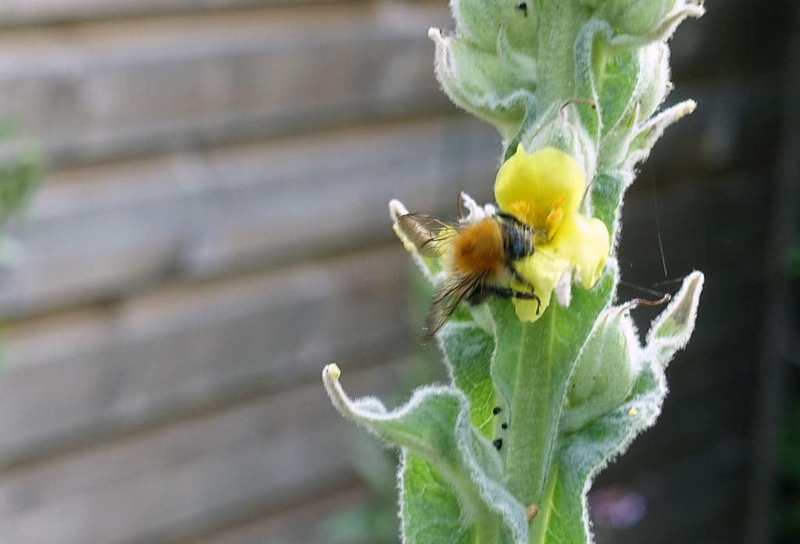 The Evening Primrose are also self-sown. They open from dusk until dawn. Here they are just starting to close for the day. 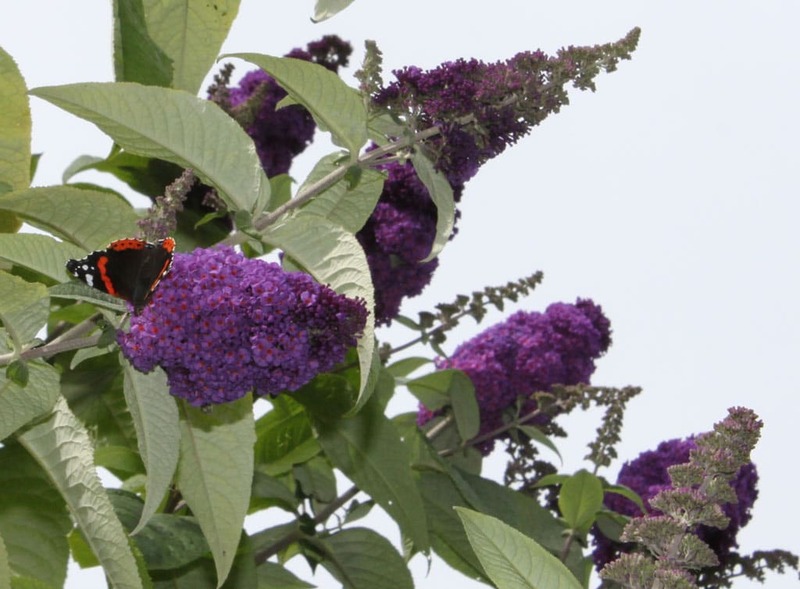 Red Admiral butterfly on the Buddleia bush. 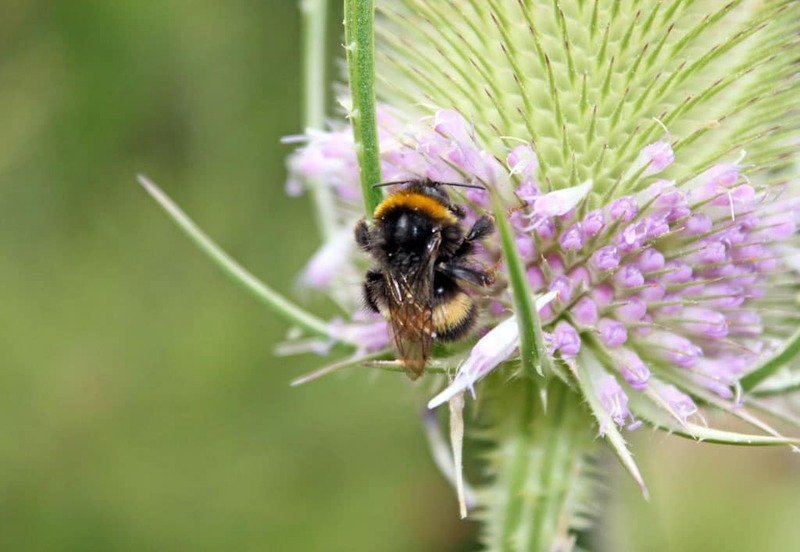 Bee on a Common Teasal. 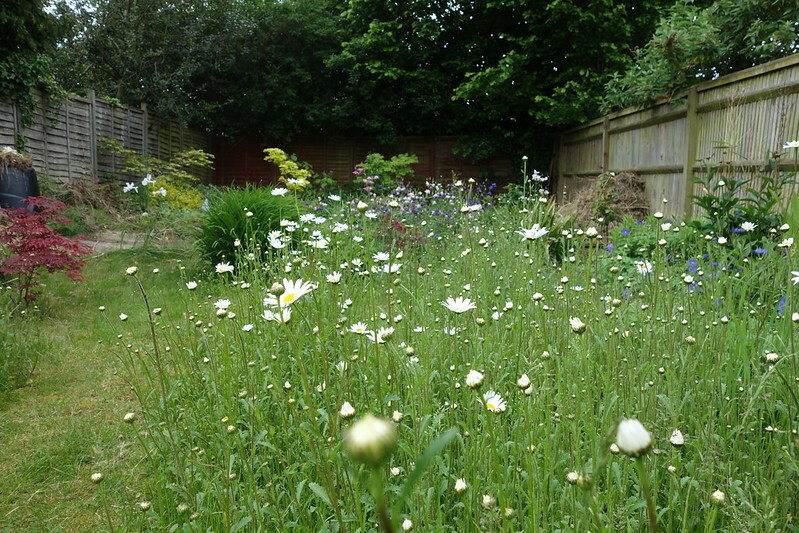 These Teasals are again self-sown and it’s tempting to pull up as weeds. But they provide height, structure and they have their own prickly beauty. In the past few weeks, I have rescued quite a few bees and butterflies which got trapped in my conservatory. Also I was in a bike shop, and seeing a butterfly in window, I felt compelled to help it escape. Perhaps I am trying to ease my conscience from killing so many slugs earlier this year (see: killing slugs and snails) But also, for a moment, you can feel the freedom of the tiny creature as it flies off into the sky. 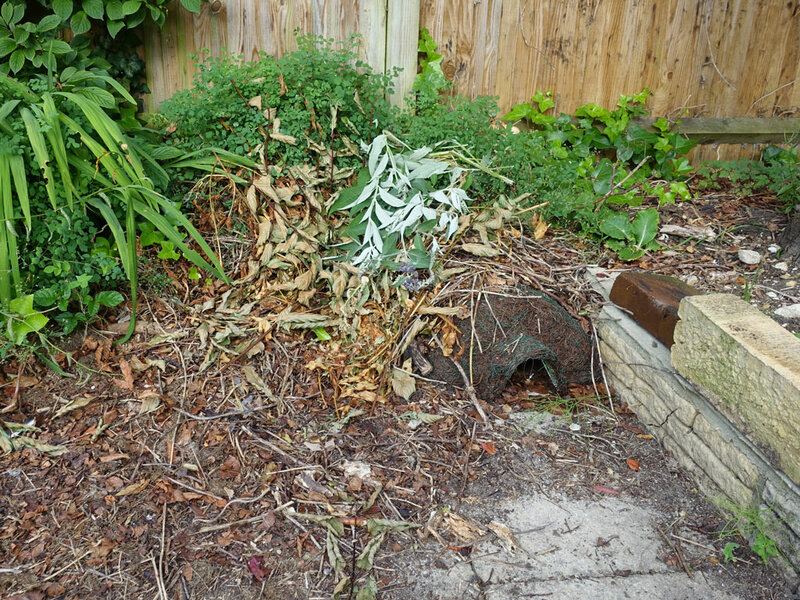 Less successful is my hedgehog house, covered with old branches and leaves. I’ve only seen a hedgehog in my garden once, a few months ago. I saw a flattened dead hedgehog on the road last week. I’d like to encourage hedgehogs because their numbers are declining, but also because they eat tons of slugs. 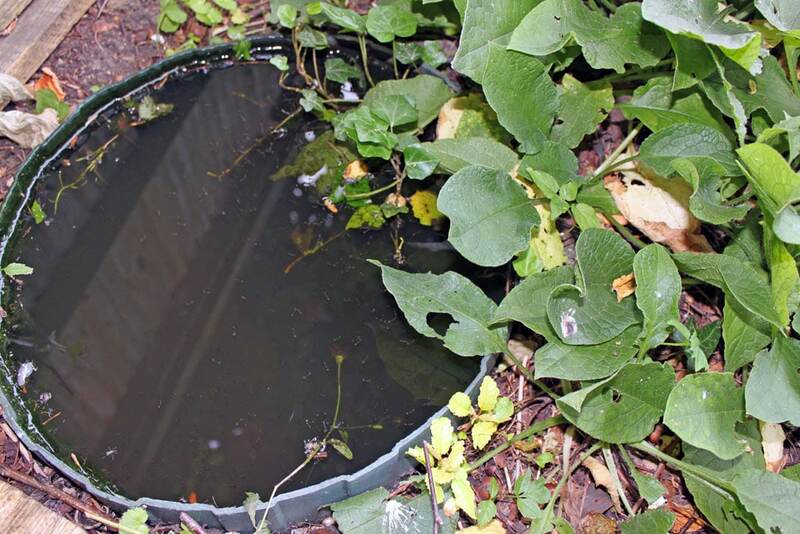 I leave out a saucer of water for the frogs and potential hedgehogs. I avoid slug pellets because I don’t want to poison wildlife, but because I don’t use slug pellets, I could really do with a few hedgehogs. This is a frog who has made his home in this old bucket. I never planned this. It was the previous owner of the house who left this old bucket under a bush. One day I saw a frog in this bucket of water. Every now and then I top up with water. 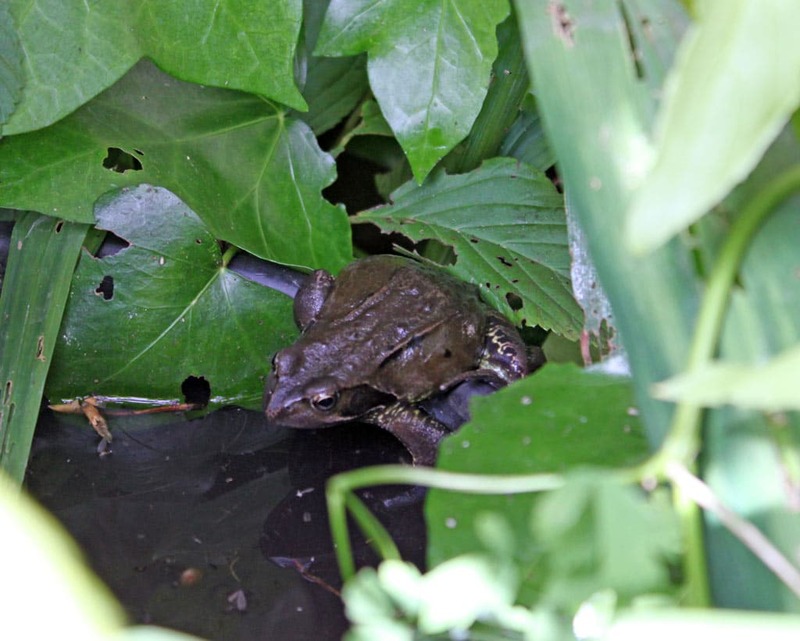 It is hard to take photos because it is hidden under shrubbery and frogs are quite shy. In another part of the garden I put this old dustbin. I cut it in half and sank it into the ground. A few frogs use this is their home, you can just about see lots of very tiny water creatures in the water. It’s always amazing how life springs out of water. 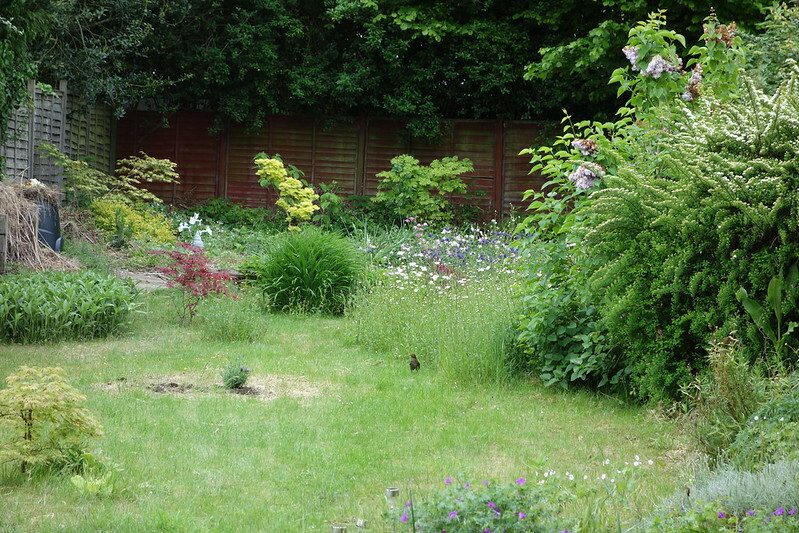 The Comfrey on the right makes good compost and you often see frogs using them as shelter from the sun. Blackbird in the grass. You can hear many birds, but they are hard to photograph. I took most of these photos with a Canon 500D. It is quite good for macro photos. I find it is best to use manual focus for close ups.